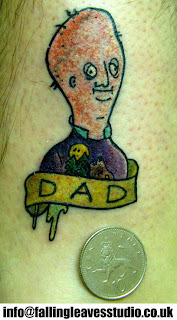 Some people tell jokes, some people do impressions, these people decided to express their comedy through their skin. These jokes will make you say, "I'm not laughing." And will make your father say, "Hi, Not Laughing, I'm Dad." Keep your chin up ""things could be MUCH worse. 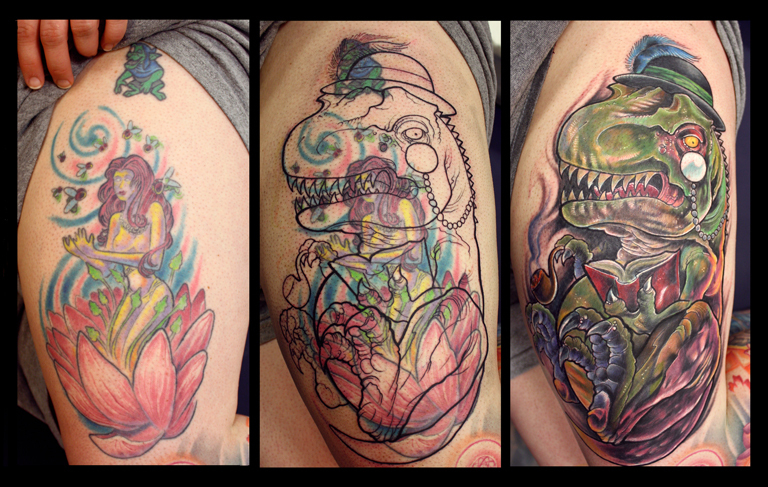 Excuse us while we head over to the nearest tattoo parlor. 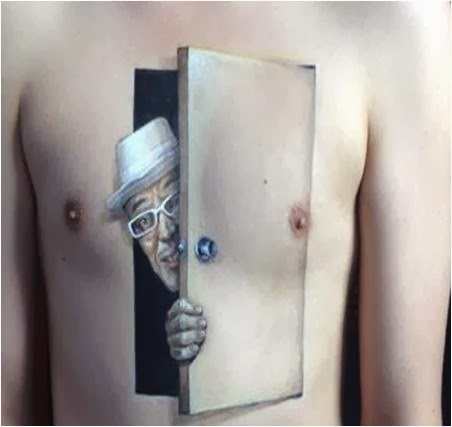 These people have tattooed and pierced their bodies into works of art! 10 Jokes That Are So Bad, They're Good! At least one of these gags will make you gag. This article is not for the faint of heart. 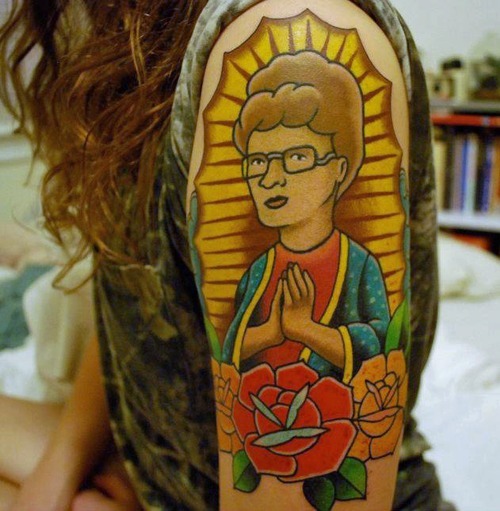 This cover-up holds a ton of meaning. This would make the perfect Valentine's card for any Simpson's fan. 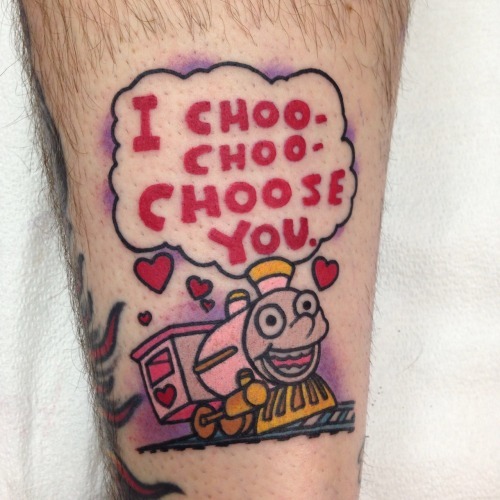 It's the little engine that could--not get a date. He is a stud muffin. 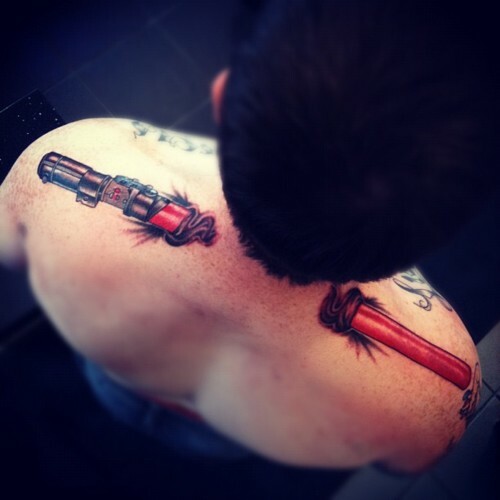 Even his tattoo has a tattoo. Someone should get him an ice pack or something. Is this a light saber, or the coolest looking push pop ever? 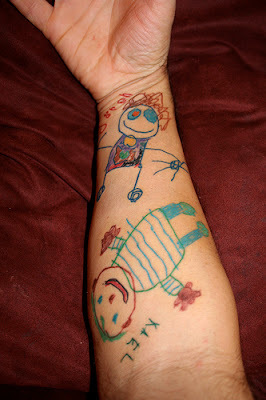 When he was younger, it was a tattoo of a crayon. We hope she doesn't get offended if people start calling her two-faced. Food is always on my mind as well. Now he'll always have breakfast in bed. To be fair, I think everyone has wanted to kill Bart at some point. 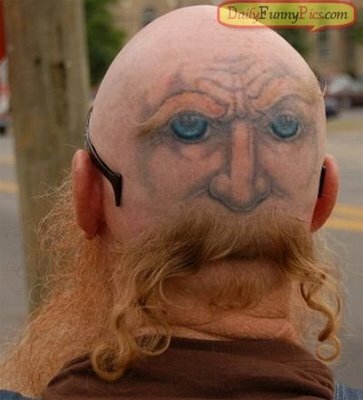 This was a pretty sweet tattoo-- until he fell asleep at the park and people started playing checkers on his face. It's good to see Chewbacca finally grew up and made something of himself. You should see how bad his evil twin is, Tupacca. Their slogan may be "I'm Lovin' it" but only someone who gets a tattoo of their receipt can truly say they're "lovin' it." This little piggy stayed home and watched YouTube videos all night. We love Mr. Sparkle! And we always wondered what Homer would look like as a Pokemon. 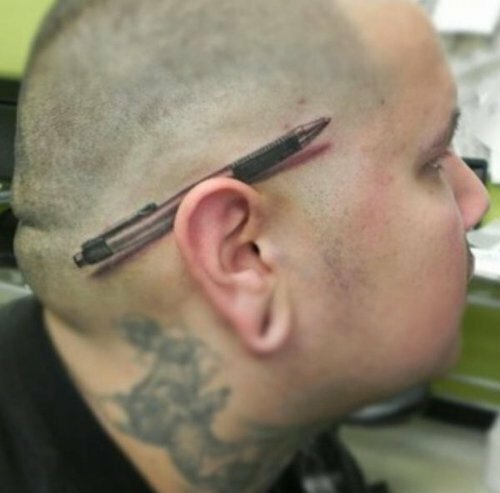 This tattoo is truly hair-raising. If you stare at this too long, you'll tear your own shirt off. Does that make daytime television Heaven? 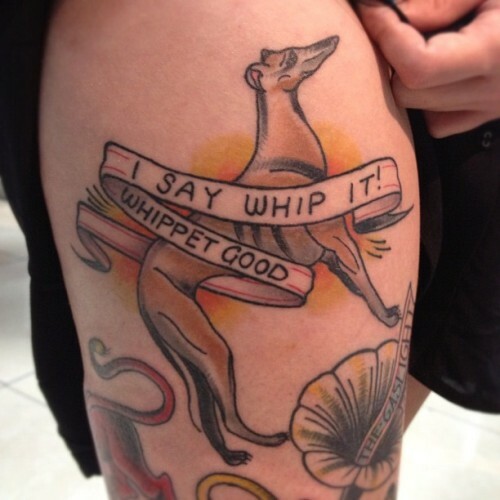 Whippets are a breed similar to greyhounds, except they're a little smaller and a lot better at making Devo references. 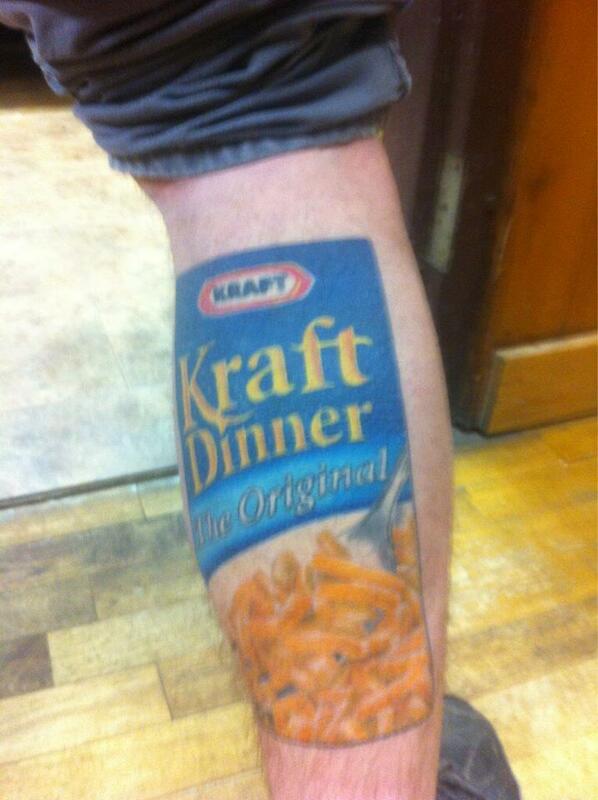 You'll never know how much this hurts until you walk a mile in this man's shoe tattoo. Do the curtains match the drapes? Wait, please don't answer that. This is what happens when you drink three energy drinks in a row. 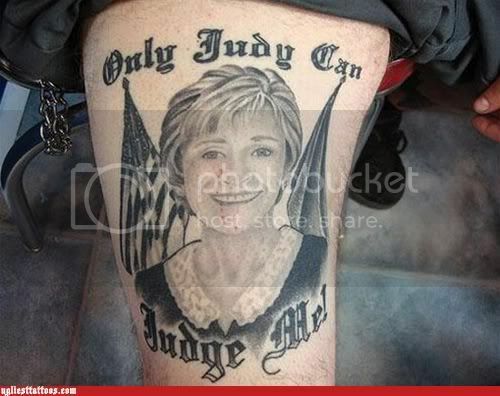 I'm not judging your tattoo. I'm judging your taste in music. 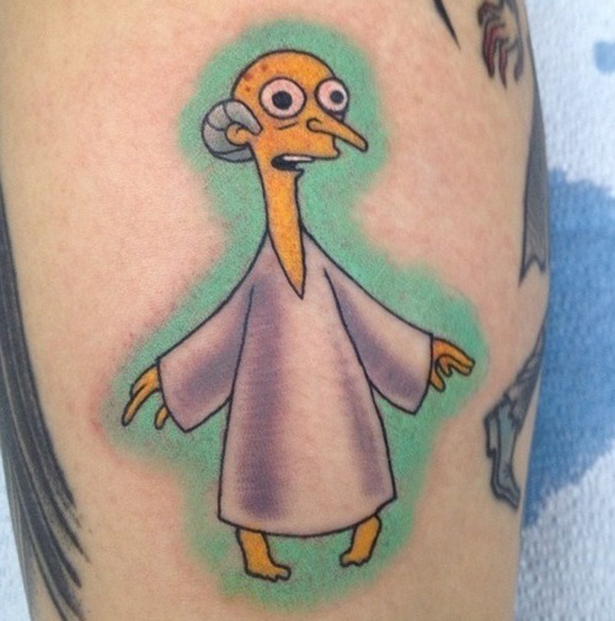 A tattoo so funny, you'll jump for joy. Refrigerators are temporary, but forearms are forever. We hope he goes by the name Funkmaster Flex. 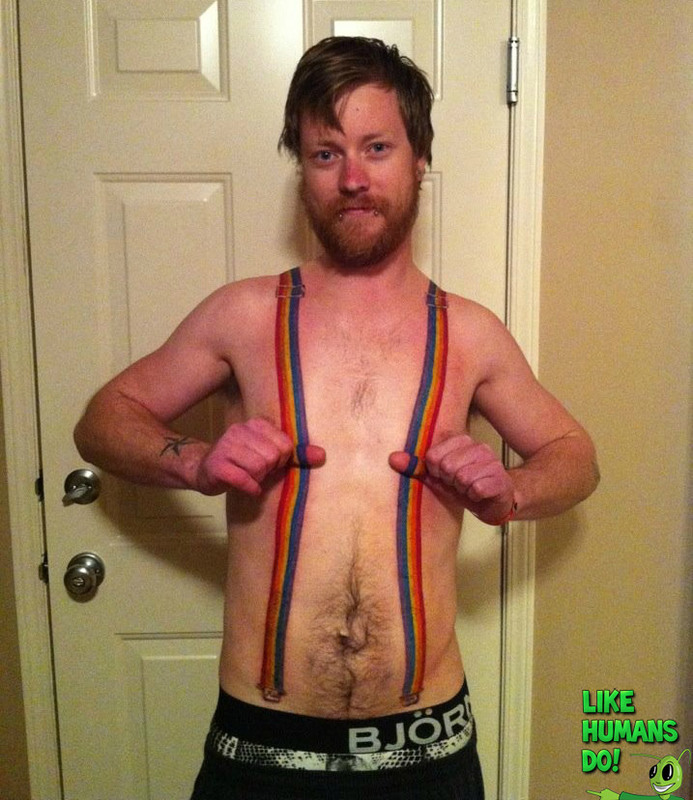 His OKCupid profile claims he has a six pack. This episode will be forever BURNed in our memory. 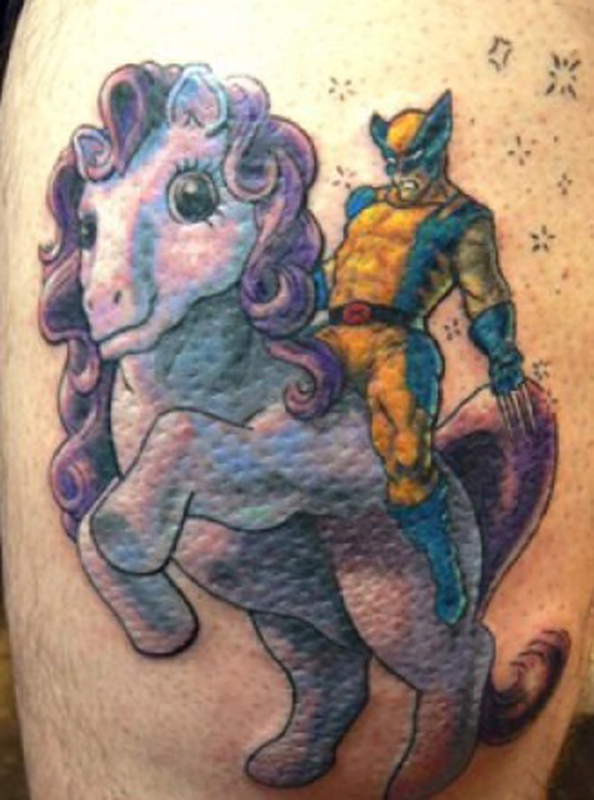 Well, we do think Wolverine always sounds a little horse. "Whatever happened to the tattoo you had of Jennifer?" "Jennifer? Jennifer is dead to me." Actually, all dogs go to Kevin. 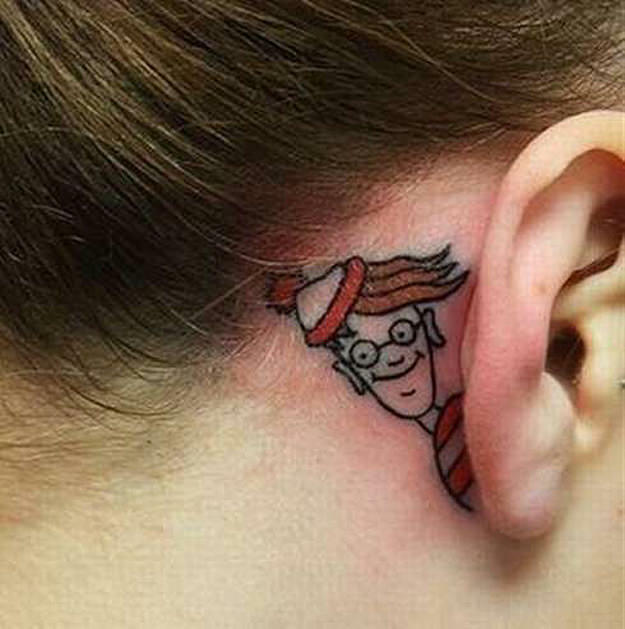 He has the tattoo to prove it. In case you ever wondered what a thumb with a face would look like. If you think that face is bad, you should see the front! 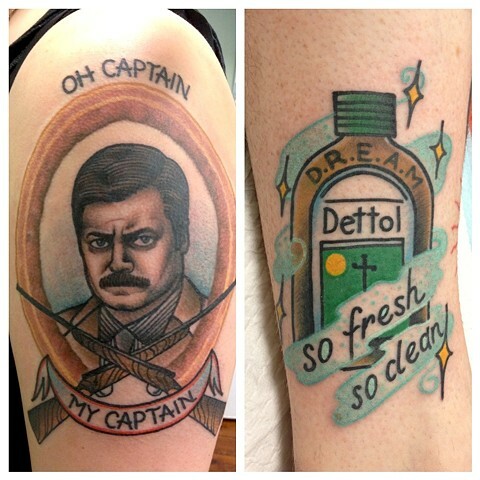 We hope their other arm is inked with Ron Burgundy. Mr. Peanut had a little too much to drink last night. That or he is deathly allergic to himself. This is a gouda pun. Grate job guy. Who has two thumbs and is a whole lot of fun at parties? This guy! We'd make a food pun right now but it just seems so cheesy. 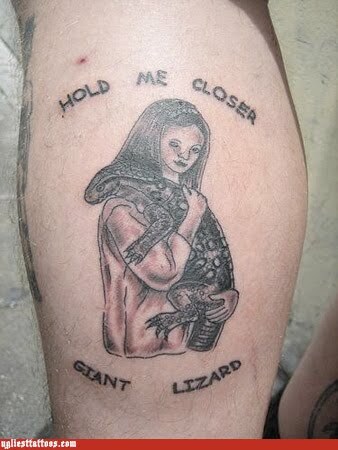 The biggest tragedy is that someone paid for this. Maybe it's time for AN impromptu grammar lesson. 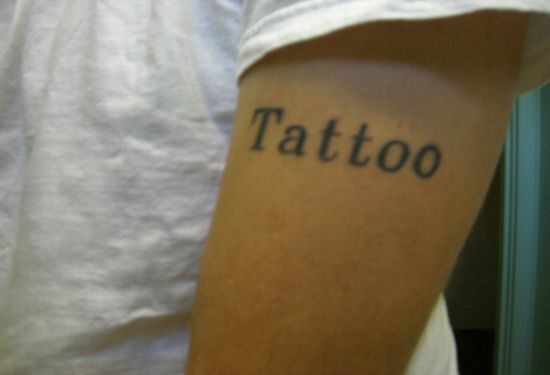 Right click this tattoo for other synonyms. 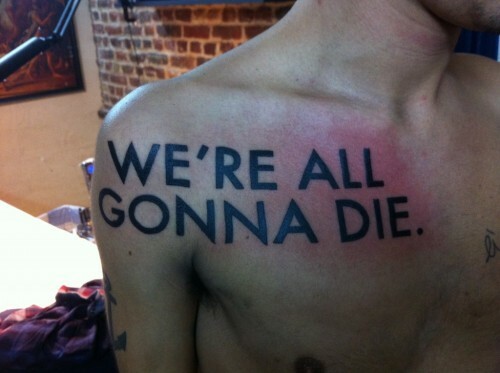 This tattoo is legendary although I don't think any "legends" would ever get it. "Gramps" and "Pops" are acceptable things to call your grandpa. 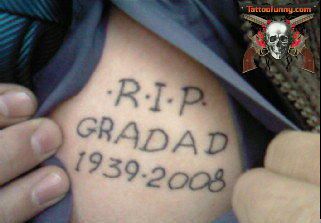 "Gradad" is not. I am jealous of your spelling skills. The moment you wake up hungover and realize you got a name tag tattoo. The moment after that when you realize your name isn't Scott. Bobby? Now I go by Lil B. Speaking of counting, I wonder what number this is on their list of regrets. Now when they fight it looks like you're playing footsie with yourself. Now we know what he's always thinking of. No need for him to give us a pizza his mind! It's going to be really awkward when paper and scissors find out about this. Godzilla never looked so adorable. 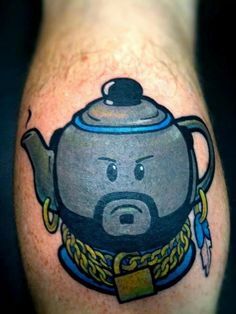 I PITY THE FOOL who drinks me without a lovely side of scones. 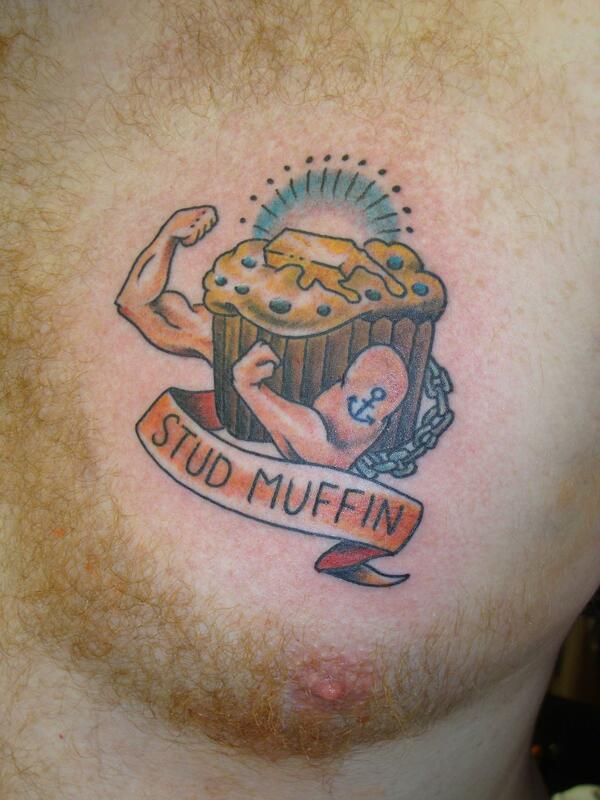 What's actually impossible is that he didn't think his employment through before getting this tattoo. These two are either eating dots which will lead them to kiss, or they're spitting dots into each other's mouths. Either way, it's pretty romantic. The one pipe you can always smoke indoors. Like this font, for example. 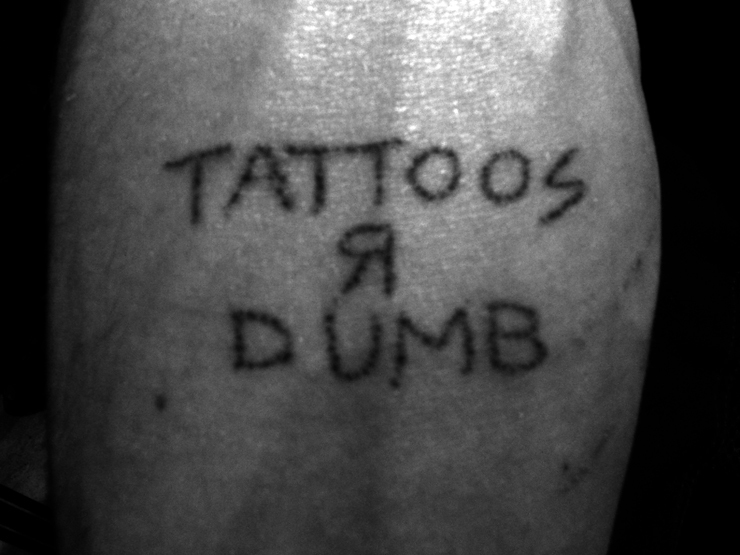 This person thinks ironic tattoos R clever. 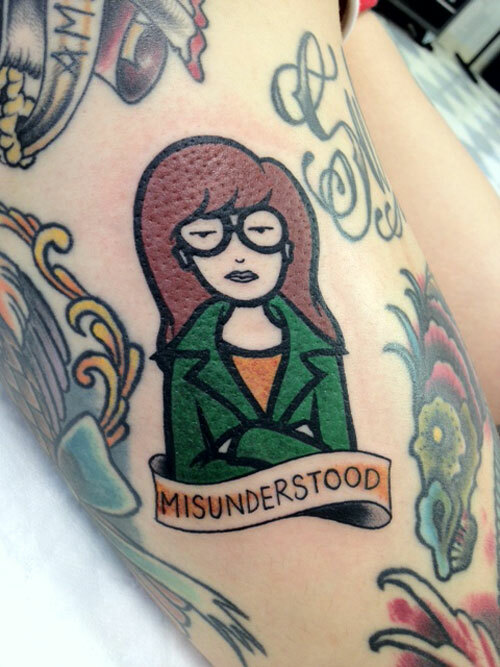 The only thing that is more misunderstood is why they didn't get the whole cast tattooed on here. 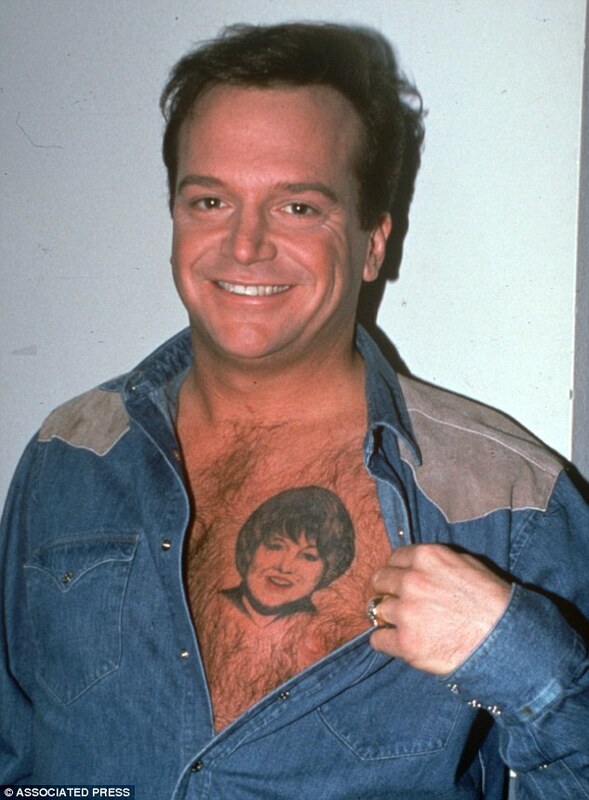 When you mouth of to Tom Arnold's tattoo it will mouth off right back to you. We don't think he understands the benefits of Lasik. At least they spelled everything right. This is going to get really expensive when he has to upgrade it to a new iPhone every 1-2 years. Well, at least this will be the last thing someone sees before they get knocked out. 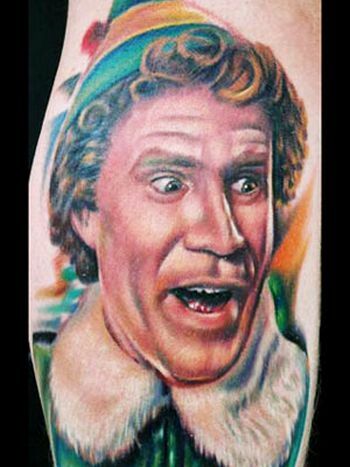 This tattoo is a scratch and sniff. It smells likes bacon, whiskey, and manhood. At least they got the eyes right. I appreciate his honesty though. This looks like the most painful game of Peek A Boo ever. Actually, he was really just asking for a refill. This guy took No-Shave November to a whole new level. Are we there yet? I'm melting. This looks like the beginning to Mambo #5. Unless you're a cat. Or Super Mario. 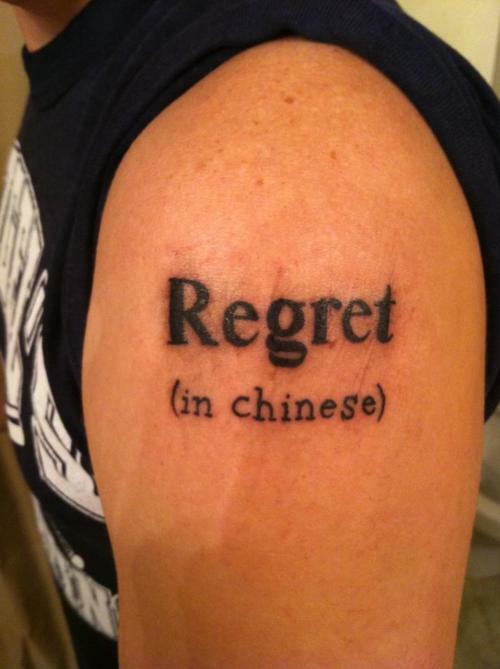 With all the Chinese symbol tattoos we wondered if people over there get English words tattoos.